If you like your pop to have enough power in it to back 100 navies, you'll find this record to be a dazzling kaleidoscope of psychedelic flavoured confectionary. Montreal psych-rockers the High Dials took a unique approach to recording their fourth full-length album, Anthems for Doomed Youth. It was put together in a home studio that was built in an abandoned building that was once home to the Canadian Navy. The place was full of naval artifacts, including old nautical maps and a giant ship engine, and reportedly had a reputation for being haunted. That last little fact is apt for this band, as the High Dials are definitely inspired by the ghosts of '60s psychedelica. There are more jingle-jangle guitars here than the sound of coins rubbing together in your pockets. The space also offered a grandiose reverb-heavy sound, and Anthems for Doomed Youth certainly has a big booming quality to it. The album may have been recorded for the indie Rainbow Quartz label, home to the Capstan Shafts and Lilys, but there's a huge cavernous sound to the record that would make bigger label acts envious. The press release notes that Anthems for Doomed Youth is the album that comes closest to replicating the band's live sound, and I don't doubt it. This is a long-player that practically demands you to play it at ear-splintering volumes, just to revel in the hugeness of it all. The style of the High Dials really harkens back to an amalgam of the Byrds, with a few pinches of the Beach Boys thrown into the stew for good measure. Or, imagine if R.E.M. had formed during the Summer of Love -- that would be just an apt descriptor of the High Dials' sound. Clearly, the band is a throwback group, though it infuse its sonics with the latest in 21st Century recording technology -- there's no fuzz or tape hiss to be heard on the latest offering. The album, while it is stuffed with generously catchy tunes, doesn't get much better than opening track "Teenage Love Made Me Insane". The tune is a delightful slice of heavily reverbed, phase-shifted Rickenbacker guitars and drums, a psychedelic high that wouldn't be out of place in the canon of both Roger McGuinn and Brian Wilson alike. The song is so sunshiny and bright that it'll leave you applying liberal amounts of sunscreen in an attempt to beat the UV rays filling up your room. It's one for the band's highlight reel, a song that also captures a little bit of XTC's sound circa Oranges & Lemons. The second track, "I'm Over You (I Hope It's True)", comes off as being particularly Tommy Keene-esque, while next song "Uruguay", which the band's website notes was actually written in that South American country, has a particular Pet Sounds vibe to it. That's followed by "I Was, You Were", a song that has a certain Tom Petty-like feel and has a cute opening line that catches your ear instantly: "You were a ballerina / I was a box / You twirled around inside me / Until you picked the lock." And then there's "Chinese Boxes", with a countrified steel guitar underpinning it. It is a sort of distant cousin to Kim Mitchell's "Patio Lanterns", which makes it the least '60s-sounding cut on the first half of the record. By the time "The Rich Die Too" rolls around at the record's mid-point, things start to take a turn for the melancholic. The last half of the album is generally much more subdued and not quite as infectious, but the songs are still strong. A particular high point comes with "What You Call Love Is a Lie", which harkens to Echo & the Bunnymen in their "Bring on the Dancing Horses" phase. The comparison isn't out of the ether given this band's infatuation with the Paisley Underground -- the High Dials recently supported Echo on a tour, and something must have rubbed off in the interim. Singer Trevor Anderson even tackles the smoky, nasally vocal style of Ian McCulloch to a T; those of you who lament the fact that Echo & the Bunnymen don't quite sound like they used to will find much to be awe-struck by. "Mysterio", which precedes it, is another stab at punchy power pop, and is the album's longest track owing to the fact there's an extended guitar solo breakdown tacked onto the end that wouldn't feel out of place on a lengthy rendition of "Eight Miles High". You'll have to make sure your speakers aren't too close to the walls, unless you want your wallpaper or paint to start peeling. Finally, the album ends with a couple of downtrodden songs, including the sad "Snowed In", which has a longing Mellotron anchoring it. Still, even though it borderlines on the depressing, it still offers a catchy melody that will have you tapping your foot in spite of yourself. It definitely can be categorized as dream pop, and the song veers almost into borderline shoegaze. Then there's "Bedroom Shadows", which is a glacial ballad with a gospel chorus of female vocals slathered into the mix. It's a definite prom slow dance track if there was one, and it ends the album on a note that is quite differently stunning from how the record began. 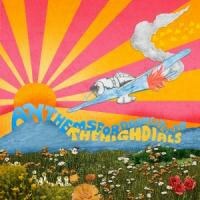 With Anthems for Doomed Youth, the High Dials have made an album that might be hailed in some quarters as an instant power-pop classic. While it may be a tad too consistent sounding, particularly in its second quarter, there is a real sense of craftsmanship in the proceedings. It's a record that almost invites you to waltz to it, as it is so contagious and bubbly (save for some of the record's last half). The High Dials won't make you forget about their influences, which they really wear on their sleeves on Anthems for Doomed Youth, but the songs are so well-written that it doesn't really matter. If you like your pop to have enough power in it to back 100 navies, you'll find this record to be a dazzling kaleidoscope of psychedelic flavoured confectionary. The High Dials certainly take up the mantle of putting together meticulous, drug-addled, starburst songs that resonate long after this album leaves your CD player. Indeed, the songs here are not only anthems for doomed youth, they are, in the best sense of Brian Wilson, teenage symphonies to God.